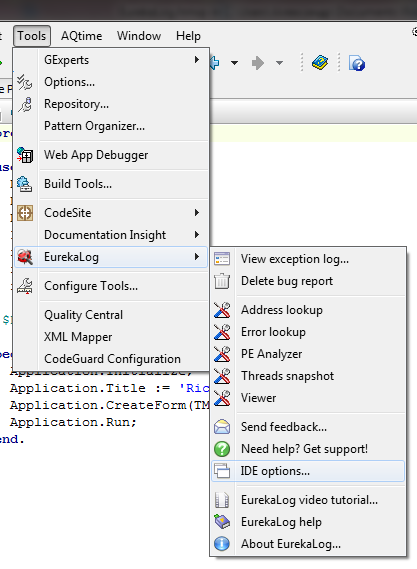 Please note that exact location and items may be different - it depends on your environment (installed IDE experts). Don't see those menu items? Check if EurekaLog is properly installed. Don't need these items? See alternatives. • Project / EurekaLog options - this command opens EurekaLog's settings for current project. If there is no current project, this command opens options for default project. This command should not be confused with Tools / EurekaLog / EurekaLog IDE options command (see below). • Tools / EurekaLog / View exception log - this command opens EurekaLog Viewer with opened bug report for current project. If such bug report doesn't exists - no action taken (there will be informational message). • Tools / EurekaLog / IDE options - opens EurekaLog settings. This is global settings for EurekaLog. It's different from Project / EurekaLog options command, which opens settings for current project only. I.e. Project / EurekaLog options command invokes global settings, Tools / EurekaLog / EurekaLog IDE options command invokes per-project settings. • Tools / EurekaLog / Address lookup - this command is analog of Start menu's shortcut for Address Lookup tool. • Tools / EurekaLog / Error lookup - this command is analog of Start menu's shortcut for Error lookup tool. • Tools / EurekaLog / PE Analyzer - this command is analog of Start menu's shortcut for PE Analyzer tool. • Tools / EurekaLog / Threads snapshot - this command is analog of Start menu's shortcut for Thread Snapshot tool. • Tools / EurekaLog / Viewer - this command is analog of Start menu's shortcut for EurekaLog Viewer tool. • Tools / EurekaLog / Send feedback - this command opens your default e-mail client to allow you to share your feedback, opinions, make a suggestion or report a bug. Please, use the next command (Need help? Get support!) for asking questions. • Tools / EurekaLog / Need help? Get Support! - this command opens your default internet browser to allow you to ask a question to our tech-support. • Tools / EurekaLog / EurekaLog Video Tutorial - launches a video tutorial for new users. • Tools / EurekaLog / EurekaLog Help - opens EurekaLog help file. • Tools / EurekaLog / About EurekaLog - shows standard "About" window. You can see a version of installed EurekaLog here.